Takes 110 / 74 pcd rings, needs 113mm bottom bracket. The chainring mounts on the spider and for the inner ring needed to be ground down before the crankset would work with a 10 speed chain. The bolt holes for the inner chainring were not concentric so the chainring moved up and down during pedaling. Can you tell me the weight (in grams) of either the 140 or 145mm crankset? The 140mm crankset weighs 484grams on our scales. I'd like to bike this crank with rings ideally 22T & 34T so I wonder which will fit into it? This chainset would not be suitable for those sized chainrings I'm afraid. The inner ring fitting uses a 74mm PCD spacing which can only allow 24T or larger rings. The 110mm PCD spaced middle and outer positions can be used with a 34T chainring though, but this would be the smallest size that would fit. Will this triple crankset have the right spacing for indexed 10 speed shifting? I know I need to change the bottom bracket, and I am planning on putting on 10 speed ramped/pinned rings (assuming I can find some), but is that all I need for it to work with a 10 speed indexed Shimano front derailleur? These crank arms can indeed work with a set of 10spd chainrings so you shouldn't need anything else to make it work. It would be a JIS taper that you would need for use with these crank arms. Other than ordering the 140mm cranksets will anything else be required to fit them onto my Nomad? Nothing else should be required providing it is the silver Thorn cranks you're replacing as the bottom bracket spacing and chin rings will be correct. We're considering this (140 mm) crankset to fit onto a Shimano Tiagra 4600 68 Bottom Bracket and then to fit with Tiagra 30/39/50 chainrings. This will be part of a new Bike Friday (folding bike) that will be assembled in the USA. Can you foresee any issues? These cranks are designed for Square taper bottom brackets where as a the Tiagra 4600 uses a Hollowtech 2 bottom bracket which is a completely different incompatible option. The triple ring Tiagra chainrings also mount to a chainset with a 130mm BCD rather than this chainset that requires 110mm BCD chainrings. So unfortunately this crankset is not compatible for what you're looking for. What Speed Drivetrains Are These Cranks Designed For? As these cranks do not come with any chainrings, you can fit any 11omm BCD chainrings for any speed drivetrain you wish. How Are These Cranks Manufactured? These cranks are at the lower end of the price spectrum and would have been manufactured in a more cost effective way than cold forging. 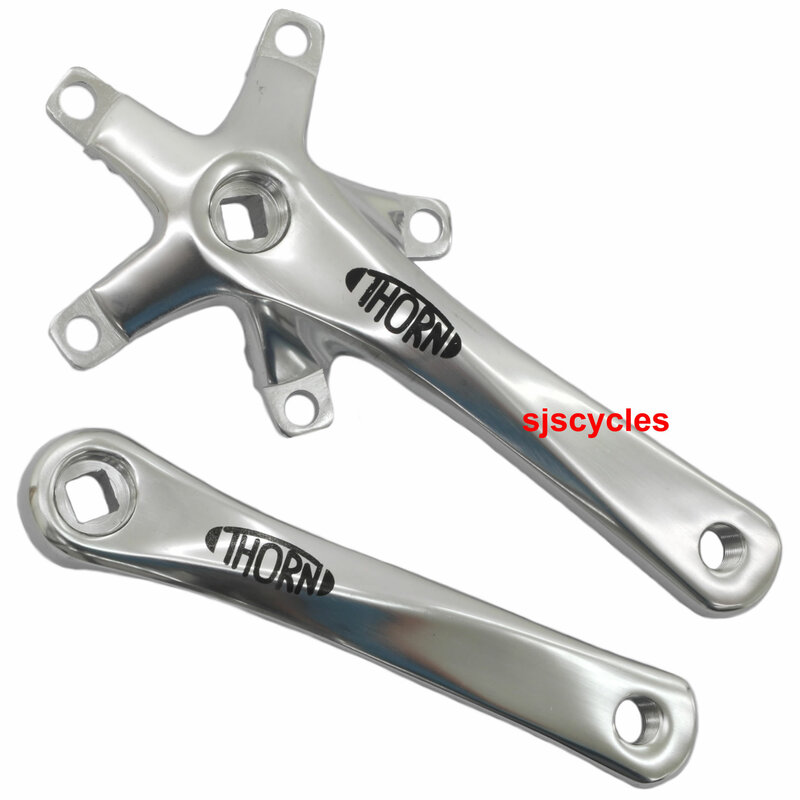 Is it possible to replace Shimano with Thorn 110/74 PCD Triple Solo Alloy Crankset ? Providing your using a standard square taper bottom bracket with your Shimano cranks then these Thorn cranks will work as suitable replacements.